Released in August of 1999, M. Night Shyamalan’s The Sixth Sense was an unlikely blockbuster. Made for only $40 million after Disney unceremoniously sold the production rights to another company, Spyglass Entertainment, the film went on to make $672,806,292 worldwide. And the film is still ranked in the top 100 earning films of all time (according to boxofficemojo.com it is currently 63rd in All Time Worldwide grosses), and is the highest grossing thriller. But its success cannot be wholly blamed on what was then a shocking twist ending. 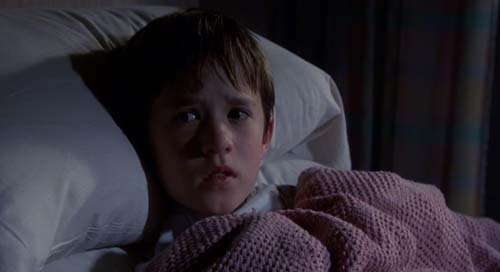 Though not a conventional horror film, The Sixth Sense created a different kind of fright – one that has nothing to do with ghosts. M. Night Shyamalan has described the film as “reality based fright. It comes from the fears of real people, real children and real adults, fears of loss, the unknown, of having a sixth sense about what lies beyond and fears of not understanding those intuitions.“ While The Sixth Sense is far more grounded in the “real world“ than the kind of flight of fantasy that characterizes other horror films, like those featuring vampires or werewolves, the film shares many of the classic elements of Gothic fiction. The give-away Gothic elements include the appearance of ghosts, hauntings, and an atmosphere of unease and dread. Gothic fiction rose to popularity during the 18th Century and continuing into the 19th Century, primarily in England, resulted in Gothic classics like Mary Shelley’s Frankenstein and Bram Stroker’s Dracula. The most important element in traditional Gothic fiction is the narrative’s setting, which is traditionally set in Europe and typically involves a decaying castle, mansion, or cathedral, usually with strong medieval roots. The setting itself is the source of much of the story’s sense of dread, recalling a period in history characterized by harsh laws enforced by severe punishments and torture, which adds to the feeling of threat and contributes to the sense of “haunting“. The setting is indeed usually described as its own character in the narrative, harbouring its own secrets and violent past. But this was a problem for Gothic fiction set in America, particularly in the 18th and 19th century, which didn’t have the same kinds of ancient ruins associated with Europe: America was too young to be Gothic. Some American authors set their stories in Europe, as Edgar Allen Poe did, while others began to develop a kind of Gothic forest or wilderness, as in Washington Irving’s The Legend of Sleepy Hollow. The Sixth Sense presents the city of Philadelphia as a Gothic setting, with many shots of the city’s architecture framed at extreme angles, and by underlining its long history. When Malcolm first meets Cole in St. Augustine’s church, he immediately connects it with a European tradition found in many Gothic stories: “You know in the olden days in Europe, people used to hie out in churches. They would claim sanctuary.“ In a history lesson in Cole’s class, the teacher explains “Philadelphia’s one of the oldest cities in this country. A lot of generations have lived here and died here. Almost any place you go in this city has a history and a story behind it.“ And like the European ruins in classic Gothic fiction, the school building has its own secrets. When the teacher asks the class if they can guess what the school was used for a hundred years ago, Cole, who knows the truth, answers, “They used to hang people here. … They pulled people in, crying and kissing their families bye. People watching – spit at them.“ When the teacher struggles to repress Cole’s frankness, he argues “Cole, this building was a legal courthouse. Laws were passed here – some of the very first laws of this country. This whole building was full of, uh, lawyers, lawmakers.“ Cole agrees, insisting, “They were the ones that hanged everybody.“ Cole’s supernatural “insight“ sees through the repression of the truth of the past. 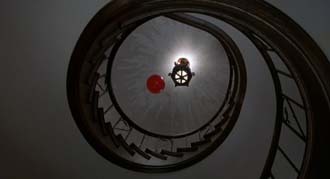 America’s uncomfortable history of slavery is also suggested in the film at Derrick’s birthday party, when following a red balloon which floats to the top of a spiral staircase, Cole begins to hear the disembodied voice of a ghost coming from the very old house’s dumb-waiter. The panicked man’s voice reveals him as a slave being punished for a perceived crime: “Help me. Is somebody out there? Open this door, please, come on. I can’t breathe. If you can hear me, open this door. I swear on my life I didn’t take the master’s horse.“ The atmosphere of history is further underlined by Malcolm’s wife Anna, who works in an antique store. She explains to an engaged couple looking at an antique ring “I think maybe when people own things and then pass away, a part of themselves gets printed on those things, like, fingerprints.“ Anna’s description of “fingerprints“ being left on objects people have owned is a kind of ‘haunting’ concept which could easily describe how settings come to be haunted by people’s ghosts. Here we find another Gothic convention, that of the doppelgänger, or doubling between characters. Cole and Vincent are heavily twinned in the film. The most obvious way they are brought together is they are both able to see and speak with ghosts. And it is a recorded session with Vincent that allows Malcolm to believe and ultimately help Cole. 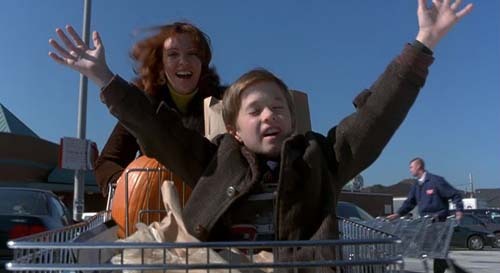 When confronting Malcolm at the beginning of the film, Vincent summarizes Malcolm’s clinical assessment of him, “Single-parent family. Possible mood disorder. I was afraid! 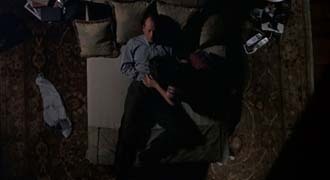 You told me I was having trouble coping with my parents’ divorce.“ In the next scene, Malcolm reviews his notes of both Vincent and Cole, on which the same symptoms are circles for each of them, including a parental divorce, “acute anxiety“, “socially isolated“, and as Vincent echoes, “possible mood disorder“. Vincent and Cole also share signs of similar scratch-like injuries, as Cole explains to his mother at the end of the film, scratches and marks which are caused by ghosts trying to hurt him: Vincent has these marks on the back of his shoulder, Cole on the inside of his wrists, and later on his back. Vincent also has a lock of white hair in front of his right ear; Cole has a similar lock of hair behind his right ear. This challenging of reality is at the heart of the Gothic tradition, and is related to what writer and famed queer theorist Eve Sedgwick points out is the single major element of the Gothic: the presence of a hidden truth behind the surface of a seemingly straightforward narrative. Sedgwick explains this hidden reality is often contained within the consciousness of a single individual. 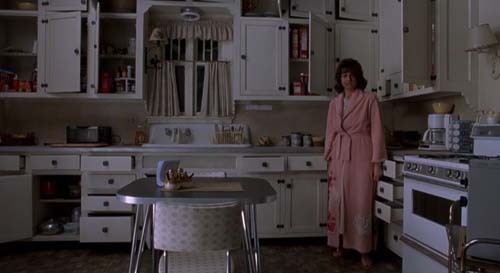 For Sedgwick, this character’s self is split, she describes this person as “massively blocked off from something to which it ought normally to have access.“ In The Sixth Sense the figure representing the surface and the hidden narrative is undoubtedly Malcolm. Within the surface narrative, Malcolm, having lingering feelings of guilt of his failure to help Vincent and his resulting suicide, begins to help Cole, whose similarities to Vincent offer Malcolm a second chance to atone for his perceived mistakes with Vincent. However, what Malcolm is “massively blocked off from“ is the awareness that he was killed during his encounter with Vincent, and is interacting with Cole as a ghost. Because Gothic fiction involves a surface narrative and a hidden “truth“, Gothic storytelling tends to resist conventional continuity. Sedgwick explains that because of the “massive inaccessibility of those things that should normally be most accessible, the difficulty the story has in getting itself told is of the most obvious structural significance.“ So, Gothic narratives usually have multiple narrators or use documents to help tell parts of the story inaccessible because of the protagonist’s limited, “blocked off“ awareness. The Sixth Sense uses several documents in its storytelling, Malcolm’s clinical notes and the various shots of his textbooks and research reinforce the surface narrative by anchoring Malcolm in the “real world“ of medical, scientific fact. They also underline the similarities between Vincent and Cole and suggest Malcolm’s emotional motivation to help Cole is to help Vincent. For Malcolm, though, this reliance on medical diagnoses keeps the awareness of his death hidden from his own consciousness. 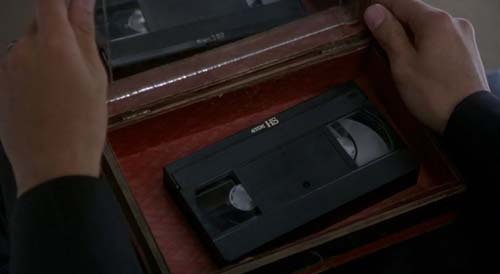 The film also features two VHS tapes, Malcolm and Anna’s wedding video which Anna seems to be continually watching, and Kyra’s tape which captures her mother intentionally poisoning her. Kyra’s tape allows Cole to help her bring the truth about the real cause of her death to light for her father and helps Cole accept that the ghosts haunting him are actually seeking his help rather than trying to hurt him. Malcolm and Anna’s wedding video is critical for concealing the hidden narrative since Malcolm’s interactions with Anna cannot include direct interaction or dialogue between them. Malcolm coming home to discover their wedding video playing allows Malcolm to emotionally connect to his wife and their relationship without actually interacting with Anna. His emotion at hearing Anna’s friend describe how she loved Malcolm the moment she met him clearly motivates him to talk with Anna but when he discovers her in the shower and finds a bottle of anti-depressants belonging to her he is shocked into retreating. This moment motivates the distance between them while still reinforcing Malcolm loves her. The other document which contributes heavily to the narrative is the tape recording of Malcolm’s session with Vincent which finally leads to Malcolm’s acceptance of the truth of Cole’s visions, a revelation for Malcolm which creates closure with Cole and forces him to seek closure with Anna and ultimately himself. While putting good use to this literary convention, being a film The Sixth Sense has several narrative techniques not available to literature, and the structure of the film actively conceals the hidden narrative. As viewers, our heavy familiarity with continuity editing (a system adhered to by the overwhelming majority of mainstream films) creates a kind of functional blindness. In several places, Shyamalan deliberately uses editing to motivate the viewer to make particular assumptions about the plot. The first instance, and indeed the most important, is following the opening sequence in which Vincent shoots Malcolm and then himself. 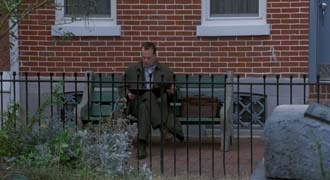 The scene ends with Anna running over to Malcolm who’s lying on the bed wounded but still speaking, the scene fades to black before cutting to an establishing shot of a neighbourhood with an intertitle which reads “The Next Fall – South Philadelphia.“ We then see Malcolm reading his notes on a bench. Continuity editing demands that unnecessary scenes be omitted from the final film, for example, we don’t need to see a couple getting into a car and driving to a party if nothing significant happens on the drive, a short conversation about going to the party and then a cut to them arriving is enough to create the assumption in the viewer the couple got some kind of transportation. By having the last shot of Malcolm after he’s shot be one where he is still alive and then cutting to him sitting on a bench, even with the acknowledgement of the time which has passed creates the assumption that Malcolm, first, survived the attack, and secondly, probably received medical treatment during the time which has passed, and that thirdly, that he has returned to his work and has been referred to a new patient, Cole. Later, the film cuts from Cole going to school at the beginning of a day to his mother, Lynn, sitting across from Malcolm in their family room. Though they are not speaking to each other, the editing doesn’t allow this to settle in before Cole arrives home. The assumption is Lynn is the one who sought treatment for Cole and has invited Malcolm in to wait for Cole to arrive home and we infer they have probably had some kind of conversation. Another assumption created by editing comes after Cole has an outburst in his classroom and Malcolm meets him in the school library. We automatically fill in the logical gap that the school called Malcolm to come speak to Cole, knowing he is Cole’s therapist. The same kind of assumption occurs when Lynn takes Cole to the hospital after he collapses at Derrick’s party. Malcolm is seen sitting with Lynn when the doctor speaks to her about Cole’s test results, again, another assumption that he would be a likely phone call after Lynn decided to bring Cole to the hospital. Because continuity editing omits anything superfluous, we never see Malcolm just “at home“, other than when he’s in his basement office looking over his notes or doing research in relation to Cole. We also never see Malcolm driving or otherwise interacting with anyone else other than Cole. Malcolm simply “appears“ in places, the strangeness of which is concealed by the editing because most characters in most films “appear“ in places in the same way, and thus we don’t realize that Malcolm really is just appearing. But none of this is not to say the film doesn’t offer clues to the hidden truth throughout. The major system of clues in the film is the use of the colour red. Shyamalan explains that the colour red in the film denotes “anything in the real world that has been tainted by the other world.“ Cole is almost always wearing a shade of red, most notably the day he is attacked by the spirit in the dumb-waiter he is wearing a bright red sweater. He is also led to the top of the stairs by a loose red balloon, the only red balloon in the house, which floats to the ceiling, and later pops when Cole screams inside the cupboard. 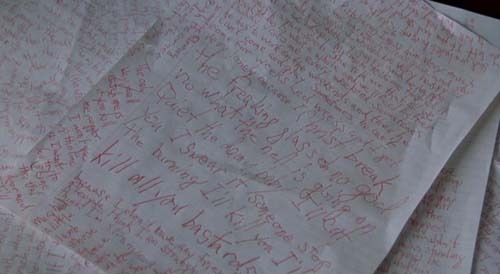 Cole’s free association writing which appears to be “channelled“ from the ghosts constantly around him is all written in red ink. And in addition, Cole’s sanctuaries, or “safe“ places are also associated with red: the door to the church is red, as is the small tent in his bedroom is made of red blankets. 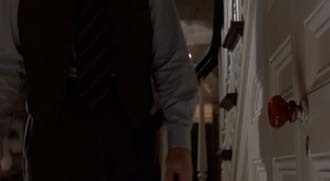 The doorknob to the basement in Malcolm’s house which is always locked is red, and Anna is often wrapped in a red blanket while sleeping and wears a red dress during the “anniversary dinner.“ The volume knob on the tape recorder on which Malcolm hears the ghost speaking to Vincent has white numbers until the number 5 where the numbers are increasingly dyed red until 10, the volume at which Malcolm clearly hears the voice, which is completely red. The box containing Kyra’s VHS tape which incriminates her mother in her death has bright red lining and red trim. In the video itself, Kyra is fed reddish tomato soup, and the bottle cap on the chemical solution Kyra’s mother pour into her soup is red. The mother is also wearing a bright red suit at Kyra’s funeral. And there are other clues, Malcolm only wears the clothing he wore on the night he was shot. And aside from the window to Anna’s shop which he breaks in an intensely emotional moment, Malcolm never moves or interacts with physical objects, for instance, when he arrives at the restaurant on the night of his and Anna’s anniversary, when he sits down across from her he doesn’t move the chair at all. And although Malcolm constantly touches the red doorknob to the basement, we never see him actually open or close a door. Malcolm also seems subconsciously aware he’s dead. He refers to himself in the past several times, for example when Cole asks Malcolm if he’s a good doctor, Malcolm replies “I used to be.“ And when Malcolm tells Cole the “bedtime story“ of why he’s sad, he begins with the phrase “Once upon a time there was this person named Malcolm.“ After describing discovering his mistake with Vincent he adds, “Ever since then, things have been different. He’s not the same person that he used to be.“ When apologizing to Anna for being late to their anniversary dinner, Malcolm explains “I just can’t seem to keep track of time.“ And once Malcolm realizes Cole really is seeing ghosts, he quickly surmises what it is the ghosts are approaching Cole for: “They just want help.“ Which, as it turns out, is exactly why Malcolm is drawn to Cole, as he is seeking help finding closure with his memories of Vincent. Malcolm’s last name, Crowe, is also a clue, as crows are heavily associated with death since they are black in colour and eat carrion. But perhaps the biggest clue comes during the hospital scene, when Cole reveals his secret to Malcolm. 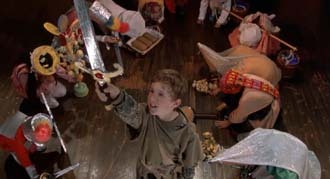 During Malcolm’s failed attempt at a bedtime story where a young prince goes for a drive and nothing at all happens, Cole interrupts him and explains that for stories to be effective, “You have to add some twists and stuff.“ A moment later, as Cole tells Malcolm he can see “dead people,“ the editing hints that Malcolm is dead as when Cole describes ghosts “[Walk] around like regular people,“ and that “They don’t see each other. They only see what they wanna see. They don’t know they’re dead,“ the camera continually cuts to Malcolm, implying Cole is speaking about Malcolm. In fact, producer Frank Marshall was so worried the editing was too much of a hint and would ruin the ending, he spoke with Shyamalan about re-editing the scene. But again, such is the familiarity of continuity editing, where alternating shots between two people during a charged conversation in order to register the listener’s reactions are commonplace, viewers don’t read anything else into the scene. Although Malcolm doesn’t push Cole to reveal his secret, this is clearly at the crux of their relationship. Malcolm agonizes over how Cole came by his scratches and what is causing Cole’s anxiety, which in turn also makes him wonder about what it was exactly that was troubling Vincent. As he tells Anna at their anniversary dinner, “They’re both so similar. Same mannerisms, same expressions, same things hanging over their head.“ And during the “mind reading game“ Malcolm plays with Cole, he guesses that Cole “[has] a secret but [he] don’t want to tell“ Malcolm what it is. Stepping forward, Cole confirms that this is true. 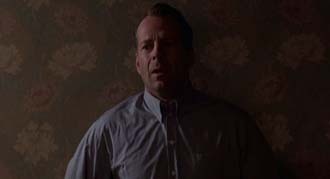 Lack of communication is also, for Malcolm, the perceived trouble between himself and Anna. At their anniversary dinner, Malcolm acknowledges this, telling Anna “I know that I’ve been a little distant. I know that it makes you mad.“ When Malcolm tells Cole the “bedtime story“ about his life and that since Vincent’s death he hasn’t been the same person, he adds, “And his wife doesn’t like the person that he’s become. They barely speak any more. They’re like strangers.“ And when Cole asks Malcolm what it is that he wants more than anything, Malcolm replies, “I want to be able to talk to my wife again. The way we used to talk to each other. Like there was no one else in the world except us.“ This distance Malcolm sense between him and his wife and his desire to heal their relationship leads Malcolm to suggest to Cole he can no longer be his therapist, “I haven’t paid enough attention to my family. Bad things happen when you do that.“ The film suggests that healing comes from communication, being open with one another. Cole only reveals his secret to Malcolm once Malcolm shares “the story“ of why he’s sad with Cole (perhaps it is not a mistake that this happens in a hospital). 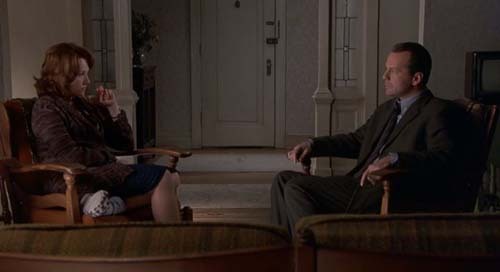 And Malcolm’s final wisdom to Cole, after they both acknowledge they “said everything [they] needed to say“ to each other, is “Maybe it’s time to say things to someone closer to you.“ And so, at the end of the film, the peace between Cole and Lynn only comes when Cole shares his secret with her and proves it by relating the secrets of his grandmother to Lynn which heals a painful memory of hers as well. The healing potential of communication is at the heart of the existence of the ghosts. 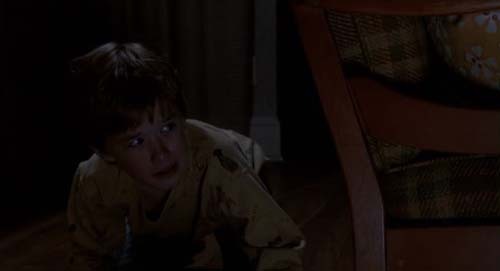 Malcolm and Cole discover that the ghosts are simply looking to be helped, and Malcolm suggests to Cole that to make them go away, Cole needs to “Listen to them.“ This suggests the concept of “unfinished business“, that hauntings are caused by the lingering souls of those who died with unhealed emotional wounds, or something left unsaid. This is another source of clues about Malcolm’s hidden secret. Many of the conversations between Malcolm and Cole occur in liminal spaces: places which are ‘between’. Spaces like hallways, streets, stairways, and even on a bus. Extending the idea of liminal spaces, the film is seemingly obsessed with doorways. Many of the shots inside the Crowe residence show doors through doorways, and when inside the house, particularly following Malcolm’s encounter with Vincent, Malcolm is almost always framed by a doorway. Malcolm’s only repeated interaction with the physical world involves the doorway to his basement which always seems to be locked – and through which we never see Malcolm pass, in fact, we never see the door actually opened either. Cole’s encounter with the ghost in the dumb-waiter during Derrick’s party also involves a mysterious door which supernaturally locks and unlocks when Cole is trapped inside. Most of the establishing shots in the film also include doorways and archways. This is another clue that throughout the film Malcolm is perpetually “between“ the doors of life and death, in a suspended state. 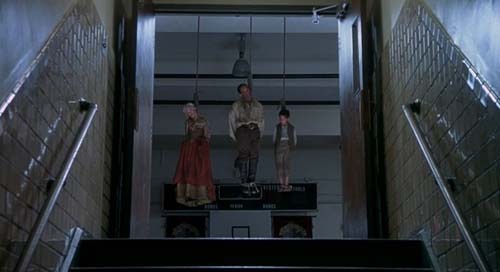 This “betweenness“ suggested by the prevalence of doorways in the film reveals the real source of fright in the Gothic. Gothic conventions create seemingly aberrant relationships between things which are usually separate. In The Sixth Sense, life and death, which seem mutually exclusive, are tightly interwoven. Both Vincent and Cole are kinds of nexus points for life and death, and indeed the narrative doubling between Vincent and Cole also crosses the boundaries of separate individuals. Malcolm is also a kind of web of life and death as he believes he is alive. The overlapping of usually separate things also extends to the film itself. 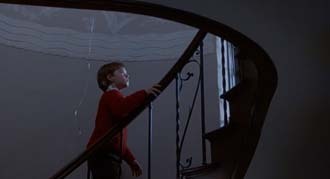 The Sixth Sense features the heavy use of sound bridges – where the sound of the next scene is heard before the previous scene ends, for instance, after Cole retreats into his red tent after encountering the ghost of an abused wife, we can hear Tommy performing lines for the school play in the next scene, “Once there was a boy, very different from all the other boys“, a line which easily describes Cole in a moment when he is experiencing exactly what separates him from his peers. This weaving of usually separate elements is precisely what threatens to expose the hidden narrative and reveal what it is that has been “massively blocked off“ in the Gothic protagonist’s awareness. The revelation of the hidden truth is indeed a threat – otherwise there’d be no need to hide it from one’s self – and the suspended state of “betweenness“ is a kind of sanctuary, not unlike Cole’s dependence on the santuary of the church or his tent filled with religious statues. The threat truth poses is the fear of the “safe walls“ of one’s psyche being breached. Hinted at by the film’s opening image, that of a lightbulb slowly illuminating, the film’s greatest source of suspense is what is “massively blocked off“ slowly coming to conscious light within Malcolm. This is partially why honest communication is presented as so difficult in the film, it is terrifying because it threatens to reveal the secret the Gothic self has purposefully kept hidden from their own awareness. For Malcolm, emotional resolution means annihilation from the physical world – as Cole points out, critical to the suspended life of the ghosts he encounters is that “They don’t know they’re dead.“ Gothic fear, suggested by the thematic weaving of usually separate states, is the tension created between the pull to reveal the secret and the paranoid desire to keep it both working at once. The ultimate revelation of the secret, for the characters, and the hidden narrative for the viewer, is what requires the challenge and ultimate doubt about what really constitutes reality. Sedgwick remarks that the only force capable of bringing the secret to light and rejoining the self with what has been “blocked off“ is “violence or magic, and both of a singularly threatening kind.“ Malcolm’s sense of reality has to be challenged in order for him to allow the realization of his own death, a realization which literally re-creates the gunshot wound on his back, in fact, the editing which furiously alternates between Malcolm in the present coming to realize his death and the scene of his death in the past. 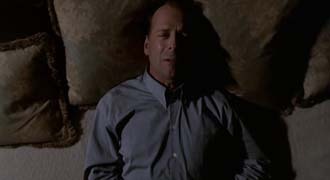 These alterations are cleverly matched visually as Malcolm leans against the wall in the present, matching the top-down shots of him after he was shot. In The Sixth Sense, real communication and the final resolution to “unfinished business“ is Sedgwick’s “threatening magic“ which rejoins the Gothic self to what was previously “blocked off“. Of course, though the revelation of the hidden narrative is poised as a threat and the greatest source of fear – even Cole seems to fear speaking to anyone about his secret more than the ghosts who follow him – it is ultimately the healing force in the story. It isn’t a mistake that Kyra, the first apparition Cole approaches to help, asking her “Do you want to tell me something?“, collapses Cole’s small tent sanctuary, nor is it a mistake that Malcolm, the spirit who ultimately helps Cole realize the importance of communicating with those around him (including the dead), is the only ghost who seems to cross the threshold into the church where Cole likes to “hide out.“ Real communication requires vulnerability, and the destruction of our psychic sanctuaries. The resolution Cole is able to bring Kyra involves delivering a very difficult, frightening message to her father, that her mother was deliberately keeping Kyra sick. 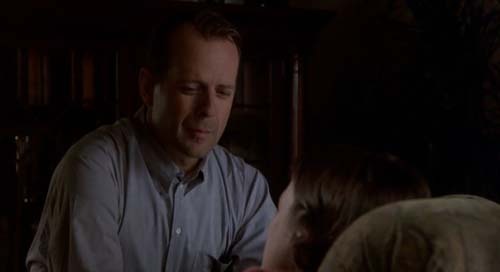 Cole is careful to tell Mr. Collins when he hands him the VHS tape, “She wanted to tell you something.“ The scene also features the only decisive crossing of a doorway. 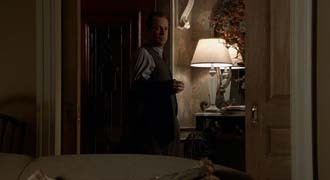 Standing outside Kyra’s bedroom, Cole is shown in the reflection of the doorknob, and after confirming Malcolm is going to wait for him, Cole is shown crossing the boundary of the doorway into Kyra’s room, an act which ultimately leads to Cole having peace with his ability to see and speak with ghosts, and a healing of his relationship with his mother. This acceptance also seems to heals Cole’s social isolation, as he is cast in the role of King Arthur in the school play and his classmates joyfully carry him around on their shoulders – something he had earlier confessed to his mother was part of his dream day. Communication and the willingness in Cole to cross fear inducing thresholds transforms his ability to see ghosts from an “aberrant“ psychological state which labels him a “freak“ by others, into an integrated part of himself which brings him strength – he does pull the sword from the stone, after all. Communication between Malcolm and Anna, Malcolm’s ever elusive desire, is what finally heals Malcolm as well. Malcolm has believed throughout the film Anna’s distance was due to her anger with him over his overcommitment to his work and particularly Cole, while the problem has really been that Malcolm is physically not being seen or heard by Anna because he’s a ghost. As Malcolm’s final advice to Cole is to speak openly with Lynn, Cole’s final suggestion to Malcolm is that he can speak to Anna while she’s asleep because “Then she’ll listen to you and she won’t even know it.“ Asleep, Anna’s conscious mind has been disengaged and thus she can more easily sense Malcolm’s presence. After Malcolm realizes he is dead, he also realizes why he has not let go of his clinging to life, as he tells Anna, “I just needed to do a couple things. I needed to help someone. I think I did. And I needed to tell you something.“ Malcolm is finally able to release himself once he finishes a conversation which occurs in the opening of the film: while Anna attempts to convince Malcolm that the award presented to him for his work with children from the Mayor is a major achievement, she remarks that Malcolm has “put everything second, including [her], to help those families.“ Malcolm here finally closes the tension of the unspoken truth and tells Anna “You were never second. Ever. I love you.“ And instead of fading to the black of unconsciousness as many scenes have done, here the scene fades into white. M. Night Shyamalan not only describes the film as ultimately “about learning how to communicate“ and points out the ability of secrets to destroy relationships, but adds the threat of what goes unsaid is “in itself … horrifying.“ The film suggests relationships are haunted by secrets, that there is a kind of supernatural element to all human connections, something beyond the rational that absolutely influences ties: we can sense distance between ourselves and another even if they are sitting beside us, we can sense unspoken things between ourselves and those we love. Even the very sound design of the film underlines this kind of intuition. As composer James Newton Howard explains, the entire length of the film has a quiet undertone of the sound of people’s breath to try create a deeper sense of anxiety in the viewer. These disembodied voices are not unlike secrets – unheard, unspoken things with no physical reality yet whose presence is still felt within a relationship, creating unease. Like secrets, the ghostly voices are simply seeking to be heard. This is perhaps the reason for the push in the film to question reality as strictly what we take in by our five senses alone. The assumptions the film’s editing creates in the first viewing of the film relies on the viewer accepting only what we see. We don’t see Malcolm die, so we assume he did not: the movie needs us to initially take for granted there is nothing more to the story than what we first experience through our physical senses. We need to be alive to the evidence of intuition because our relationships may depend on it. 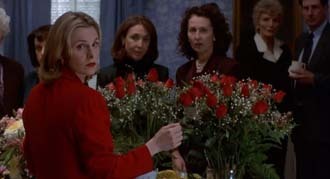 While the ghosts offer a nice thrill, The Sixth Sense touches one of the deepest horrors of life: the utter fragility of relationships, how easily love becomes distance, how easily loss can visit us, how quickly unspoken things erode connections. And perhaps most frightening of all – how easily we can hide the truth from ourselves. I said that this movie is not about ghosts, it’s about communication. And acceptance of the things we are afraid of. Then I read this and thought, wow I’m smart. Hahaha. Love this article. Thanks.